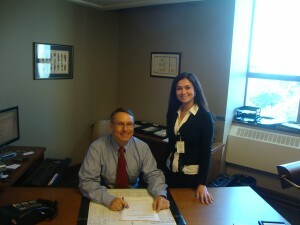 Ukrainian Canadian Congress > News > Government of Canada > New Ukrainian Intern Welcomed in the Office of Ted Opitz, M.P. New Ukrainian Intern Welcomed in the Office of Ted Opitz, M.P. (Ottawa, Ontario – October 11, 2011) Ted Opitz, Member of Parliament for Etobicoke Centre welcomes Ukrainian intern, Oksana Mayba. Ms. Mayba is currently completing her M.A. in International Economic Relations at Ivan Franko National University of Lviv. She is a participant in the Canada-Ukraine Parliamentary Program (CUPP). Established in 1991, CUPP brings Ukrainian students to Canada for a unique experience in the House of Commons. They receive the opportunity to work with a Member of Parliament to gain first hand knowledge of the Canadian political system. The program also provides Ukrainian students with the chance to represent their country and learn more about Ukraine’s relationship with Canada. Commenting on the program, Mr. Opitz stated “I am pleased to support the program as I am representing a significant Ukrainian community in Etobicoke Centre. I believe that I can learn even more about Ukrainian culture and politics by having Oksana on my team.” Mr. Opitz was elected for Etobicoke Centre during the federal election in 2011. He currently sits on the National Defence and Citizenship and Immigration Committees and will provide Oksana with an enriching experience within Canadian governance.